Made using a really awful program called The 3D Gamemaker. Because of this, you will probably have issues even running the game... let me know if you can get it working! If it says 'runtime error ###' or the screen starts flashing black and white at a rapid pace, know that it's an issue with the program I can do nothing about. EDIT: but you can! If running the game fails, delete directory C:\Windows\Temp\AckGame and it might start working. Thanks EffBee! Play at your own risk, obviously. If it won't run (or if you can't be bothered trying) I uploaded a video playthrough. If the game looks like this, you could try playing this version. Oh, wow, thegamecreators! I almost forgot about this deformed child of theirs. I never actually used the program but I heard awful things about it. Will download the game posthaste! Edit: It crashed while trying to load. cool but it needs strafe and degrees of freedom sux. I am morbidly curious how much of this is what was provided to you and what you have made. The eyeball with legs seems too... hacked together? 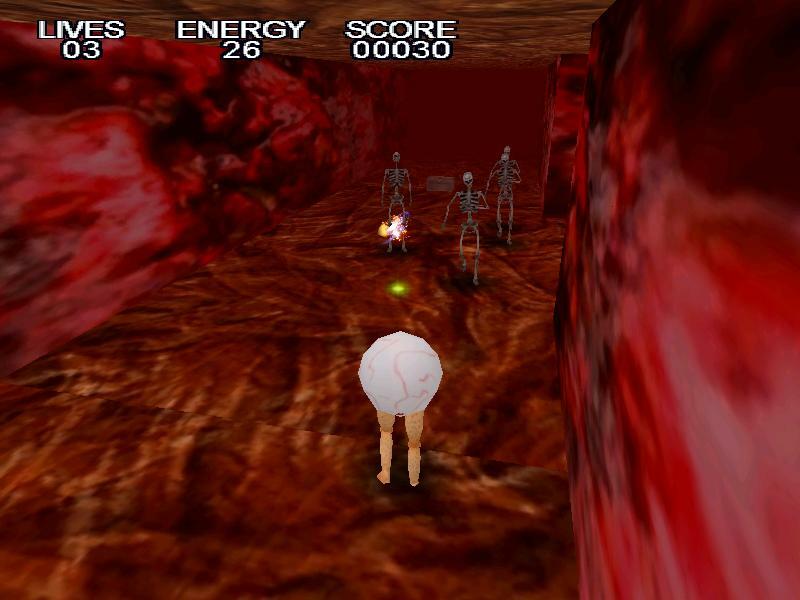 It's kind of hilarious that Eyeball shoots for the knees, and must jump to aim any higher. Was there an ending? I stopped after killing the scorpion. That's a spider, not a scorpion. There are a few more down that hall. Turn left at the end and you'll find the boss. As for ending, there's just a boring "Congratulations" text (same font as everything else) with a really pathetic one-second low-volume flourish jingle. As for creative ability, AFAIK The 3D Game Maker doesn't offer much. From what I gather, you can choose a player character, monsters, and a final boss out of a selection of premade items. You create maps by using a basic editor which can carve Wolfenstein-esque corridors. Outside of that... not a whole lot, I don't think. It's amazing to think about just how limited some of these "game making" tools are. It's even more amazing to think that amongst a lot of super-limited and mediocre tools, we have something like Klik & Play which surprisingly allows the user to do a ton! Adding your own content to games made with The 3D Gamemaker™ is difficult, to say the least, but I tried to customise as much as I could. It encourages you to choose from a bunch of pre-made player characters, enemies, bullets, items, bosses and environments. There's a user bank as well, which requires you to make your own .x files in another program. As far as I can tell, there's no way to directly set the genre or the controls, the program assumes what it will be based on the player object. You are right that the eyeball was hacked together: adding legs to things is a 'feature' of the program that I was forced to utilise as it was the only way to stop the sphere meeting the ground at its point of origin (i.e. the eyeball would constantly be halfway through the floor). It's also possible to add wings or wheels to any player object, but I think doing so might radically alter gameplay. As EffBee said, if you don't want to use one of the pre-made levels, the level editor is capable only of creating maze-like corridors that don't even allow for properly tiling textures (as seen in my game). If you go deep enough into the program's menus, there's a way to manually set the locations of enemies and items, which I did. Otherwise, the game just places them randomly and you end up with health packs everywhere. Art-wise, I did the textures for the environment and the eyeball (which you never actually get to see due to the 'wacky' camera) but every other 3D model appears as it came with the program. You can mess with enemy behaviours and variables to some degree, which I did, but you can't change an awful lot in that department. I found no way to alter the lives/energy/score thing. You can change the colour of the text. If you make a racing game, it adds a variable for laps. That's about it. You can choose from three win conditions (touch end tile, kill all enemies, collect all items), none of which I particularly like. I also couldn't find any way to change the lame 'congratulations' text that you get upon meeting the win condition. The in-game music is Soda Pop by Britney Spears slowed down using paulstretch. 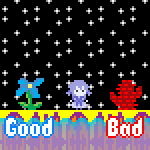 This is in the spirit of the original Eyeball game, which used a poorly sequenced MIDI of that song. I think that's everything? I was unable to run the game under Linux because Wine doesn't have full D3DRM support (it didn't know how to load the meshes and texture them). IIRC The 3D Game Maker uses DarkBASIC (the original) as the engine, which I think uses Direct3D 7, so... yeah. I then booted into Windows, but then ran into further trouble! While the game was loading, some annoying thing popped up and started flickering over the screen, so I Alt + Tabbed out of the game to close it, and then the game. I couldn't start the game back up again due to runtime errors 9 and 136! Frustrating! I examined what the program was doing by using Process Monitor. I found that it was creating temporary files in C:\Windows\Temp\AckGame. I deleted the AckGame directory and the program started working again! If anyone has run into the same issue trying to play the game, perhaps you just need to kill those temporary files. The game was definitely... interesting. I now remember what it feels like to be playing a DarkBASIC-esque game, thanks to you. I played through and finished the game after beating the stripper-esque Cyclops boss. On a final note, why is everyone throwing knives? The skeletons throw knives, which I could understand. But the spiders spit knives too! Why?! 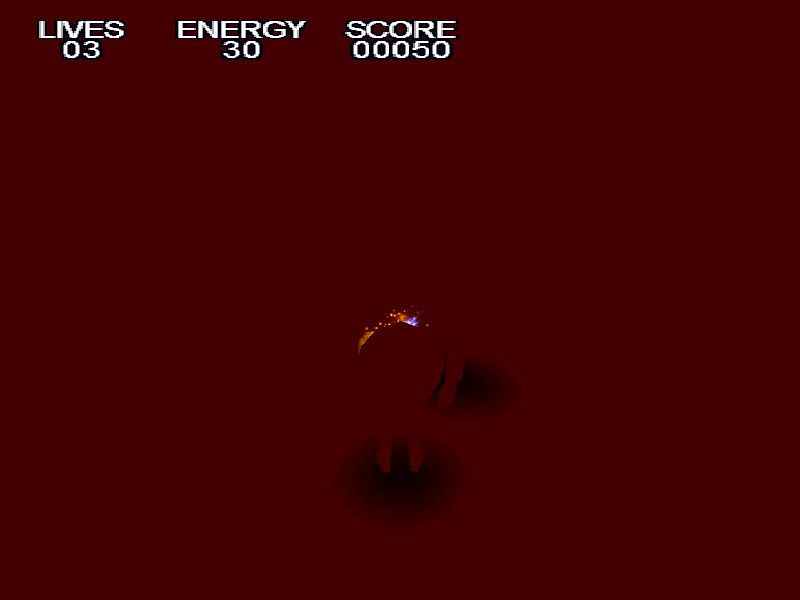 Also, the Cyclops boss throws knives which seems a bit underwhelming for, well, a boss character of that size. Congratulations! I was just uploading a video on the assumption that you'd never get it to work. It will still be a good thing to have if others have trouble, though. Very nice to have this fix, though, as the game had even stopped working for me (it only ran properly the first time I opened it). The spiders were supposed to spit webs! Must be a bug I overlooked. But yeah, the skeletons and the Cyclops are both supposed to throw knives... with terrible aim, I might add. The bosses are among the least configurable things in the software, so that Cyclops is basically as good as I could make it, as far as I could figure out at least. He's underwhelming, I agree... though his choice of attire certainly isn't. Huh. I decided to look through Wine's output again. Apparently it trips up because of trying to use 16-bit textures. Hmm... does The 3D Gamemaker allow running games in 32-bit color? I have to shoot to tell where the walls are. It's kind of like that Unfinished Swan thing. The game displayed fine for me although the player bullet texture was slightly brighter than normal it would seem, making the square borders of the texture somewhat visible. so its good you posted a screenshot. this game is just super creepy. if you cant even tell whats going on and just hear the sounds i am even more scared. I got the same thing with the bullet texture. It seems to be linked to the fog as well. To be honest, this botched version of the game looks infinitely cooler to me, but I have uploaded a version that removes the fog anyway. The spider also shoots webs instead of knives now. The lack of fog means you can see enemies from much further away, allowing you to just stand there shooting at them before you come into their attack range... oh well! My theory is that in this version, all 3D models will be invisible to you, as that was the issue that completely stopped me from running The 3D Gamemaker on my old computer.